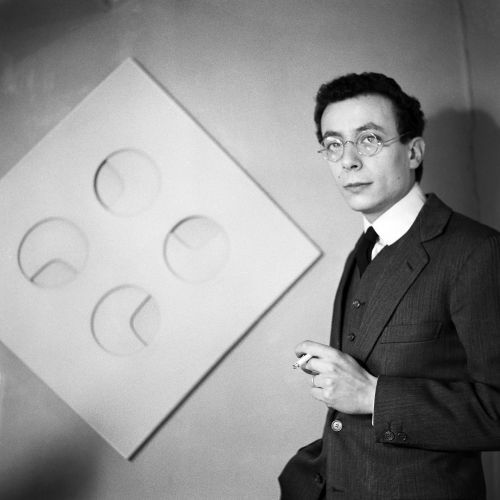 Lucio Fontana (1899- 1968), Piero Dorazio (1927-2005), Enrico Castellani (b. 1930), Paolo Scheggi (1940-1971) and Rodolfo Aricò (1930-2002) are the five pioneering artists of the exhibition Postwar. Italian Protagonists, at the Peggy Guggenheim Collection from 23 February until 15 April 2013. Curated by Luca Massimo Barbero, the exhibition is a re-reading of Italian art in the wake of the Informel painting that prevailed in the 1950s. The ‘protagonists’ brought the Italian art scene to an international public with a pictorial language specific to the early 60s, a new painting using the power of color and the iconography of the monochrome as defining visual and conceptual elements. The exhibition unfolds chronologically, showcasing the experimentation of each artist as, departing from the work of Lucio Fontana, these new generations developed a personal language at a critical moment of their artistic practice between the 60s and 70s. Postwar. Italian Protagonists offers the public two moments of special interest. Tribute is paid to Paolo Scheggi, a Tuscan artist who died young and whose experimentation and profound artistic sensibilities are rediscovered here. Among his eight works on display is Intersuperficie curva bianca (1963), recently donated to the museum by Franca and Cosima Scheggi. The spotlight is also shone on Rodolfo Aricò in two rooms which, together with an accompanying publication of his artistic production from the 1960s, were made possible by the collaboration of the Archivio Rodolfo Aricò. Lucio Fontana opens the exhibition, as a father figure in Italian and international post-war and contemporary art. Concetto Spaziale (1951) and Concetto Spaziale (1957), recent donations to the Peggy Guggenheim Collection, exemplify respectively the monochromatic ground of Fontana’s “buchi” (holes) and his more matière based work, which together lead us to the vestiges of Informel in Quanta (1960), a masterly work loaned by the Fondazione Lucio Fontana in Milan. Its nine red three-dimensional shapes form a kind of constellation of cuts and holes which anticipate the shaped canvases of American art in the same period. In its conceptual essentialism this work sets up a contrapuntal dialogue with Fontana’s ceramics of the 50s, three plates suspended between the Baroque and the great explosion of Art Informel. The exhibition proceeds with a selection of five works by Piero Dorazio, one of the founders of Italian abstract painting, centered upon his artistic practice between 1962 and 1965. His optical and structural lattices expand across the canvas in paintings such as Antelucano (1962), demonstrating the clarity of a rigorous symbolic system articulated in line and especially color. Dorazio’s abstract style is strongly characterized in Mar Maraviglia (1962) and Unitas (1965, Peggy Guggenheim Collection), focal point of this second gallery together with Durante l’Incertezza (1965), a canvas of monumental proportions (225 x 320 cm) that functions as a kind of response to the mural-sized works of contemporary American painting and testifies to the artist’s continuous dialogue with the U.S. scene. 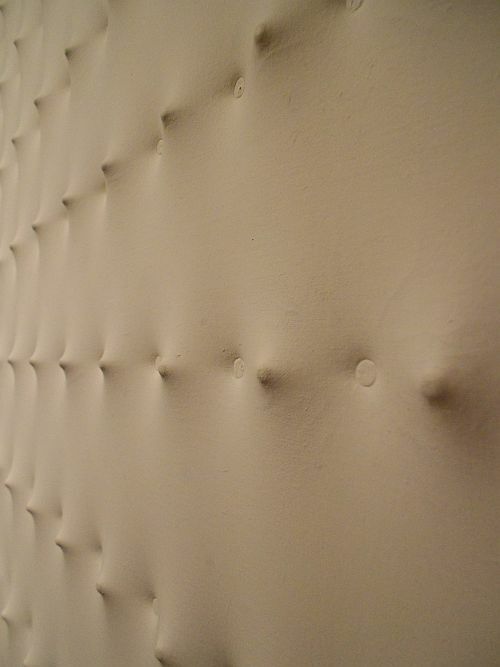 Surface, synthesis and objectification are represented in the room dedicated to Enrico Castellani, a major figure in contemporary Italian art, co-founder of the journal Azimuth with Piero Manzoni. After his early Informel experiments, Castellani, together with Manzoni, instigated the total revision of his artistic practice with the use of monochrome canvases, often completely white and ‘extroflexed’ (with extruded points and zones) in such a way as to create iridescent lights and shadows that alter according to the angle of the light source. The Castellani room provokes the gaze of the viewer with the hypnotic Superficie angolare rossa (1961), loaned by the Archivio Castellani, Milan, displayed alongside Superficie bianca (1967) and Superficie bianca (1974), here exhibited to the public for the first time. The gallery dedicated to Paolo Scheggi offers an intensely original display which brings the Tuscan artist’s innovative visual research to the attention of the wider public. One wall shows the three white Intersuperfici in counterpoint with the three black-hued Intersuperfici. A strong chromatic impact is created by Intersuperficie Curva Arancio (1969) and Intersuperficie curva rossa, hung at opposite ends of the room. The title Intersuperfici refers to three superimposed canvases, pierced by circular and elliptical openings. It refers to the play of the viewer’s gaze over the different planes. The characteristic monochrome represents the link both to Fontana’s experiments and to those of the generations born in the 1930s and 40s: a language through which the artist put behind him the expressive implications of the Informel, returning to the wellsprings of the historic avant-gardes. In tandem with this rediscovery of Scheggi at the Peggy Guggenheim Collection, the Centro per l’arte contemporanea Luigi Pecci of Prato will host, from 23 March 2013, a monographic exhibition entitled Paolo Scheggi. Intercamera plastica e altre storie on the occasion of Franca and Cosima Scheggi’s donation of the work Intercamera plastica (1967) to the Tuscan museum. The exhibition closes with Rodolfo Aricò, whose work is characterized by a rational and expressive syntax of structural rigour and chromatic sensibility. The two dedicated rooms focus on works of 1966-70 which witnessed the definition of his signature ‘object-paintings’: shaped canvases that Aricò developed in dialogue with international explorations of expressive reduction, from the Post-painterly abstraction of Morris Louis and Kenneth Noland to the Minimalism of Donald Judd and Sol LeWitt. Aricò’s forms originate from a fresh meditation on European visual culture of the past: a progression in reverse, which departs from the historical avant-gardes of the early 20th century to arrive at the perspectival Renaissance painting of Paolo Uccello, to whom tribute is paid in the work Studio 2. Paolo Uccello (1970). The return of Aricò’s work to Venice renews his connection to a city that hosted several important moments in his career, from the retrospective at Palazzo Grassi (1974) to his recurring participation in the Venice Biennale of Art (1964, 1968, 1980 and 1986).